Spring, 1454. 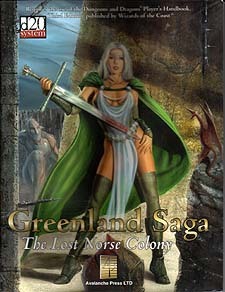 Almost five hundred years ago, Viking colonists came to Greenland. For centuries, their colony thrived onthe very edge of the known world. Then they disappeared. In this d20 adventure in the spirit fo Last Days of Constantinople, a small party of 2nd through 4th level characters investigates the decline of Europe's most distant outpost. Face the bloodthirsty Uniped, mythical foe of explorers. Meet the mysterious anagkoks, Eskimo magic-users. And find out just what has happened to the deluded, degenerate remnants of a once-great warrior people. A stand-alone adventure, or use its detaield background as source material for your own campaigns.